Green Writers Press, 9780997452815, 80pp. Nature provides the lexicon of Kinds of Snow. The poems in Kinds of Snow negotiate many kinds of loss, metaphorically represented as kinds of snow. Classifications of snow, such as prisms, cups, columns, dendrites, and scrolls, mark places among the poems as when, in a weaving, the warp becomes visible. The title poem frames presence, meaning, memory, and erasure. Several of the poems are contained in panels like Rauschenberg’s White Paintings. As the poem “Glacier” reflects, the arc of the book is lyrical rather than narrative, “from point A to point A, no point at all.” The poem “The Last of” placed second for the Joy Harjo Poetry Award judged by Dorianne Laux. Three of the poems have been nominated for a Pushcart Prize; ten have been anthologized. 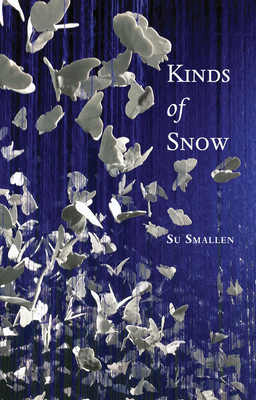 Su Smallen is the author of six collections of poetry. Her first collection, Weight of Light, was nominated for the Pushcart Press Editor’s Book Award, and Buddha, Proof was a Minnesota Book Award Finalist. Su was awarded the Jane Kenyon Poetry Prize, several fellowships and grants including from the Jerome Foundation, and residencies including with the St. Croix Watershed Research Station. With Laurel Poetry Collective, she published books and broadsides for ten years. Su was a professional choreographer and dancer, and her poetry has served as scores for dance and film, including Miracle of the Spring.